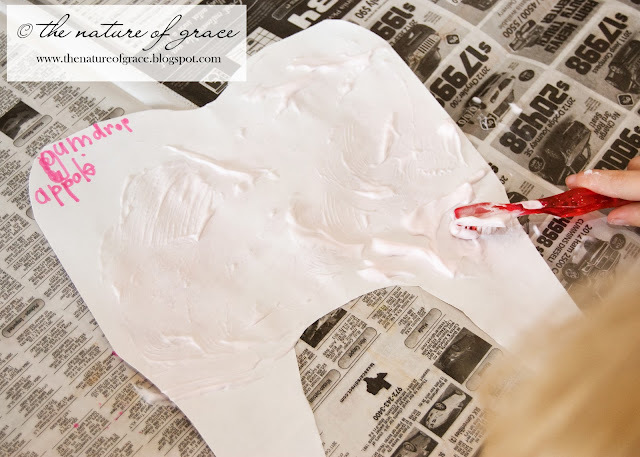 The Nature of Grace: Homeschool Theme of the Week: Dentist and Teeth! 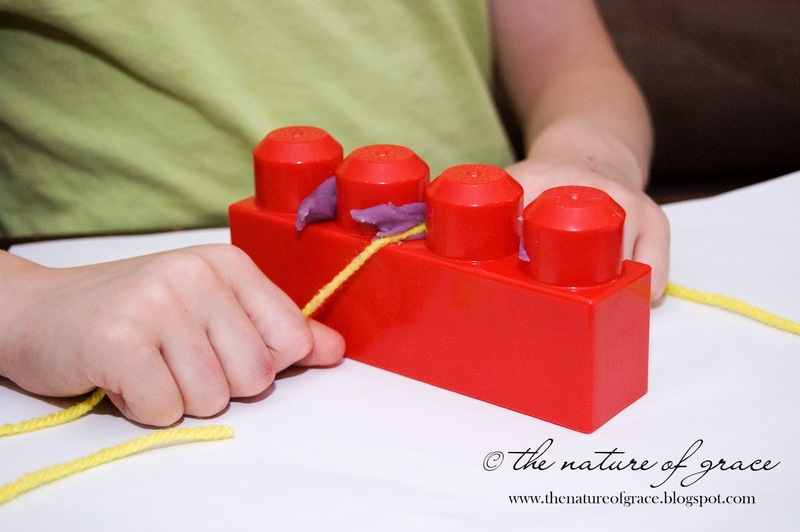 I saw this activity (see here) and loved the idea of teaching flossing by using legos and playdough so that is what we did! :) Lots of other cute stuff on the same site! Another activity (see site here) used egg cartons for teeth. I chose to smear different kinds of real food on AND in between the "teeth", and Miss A would practice brushing them in the bathroom until she was able to get them sparkly clean again. She loved this! 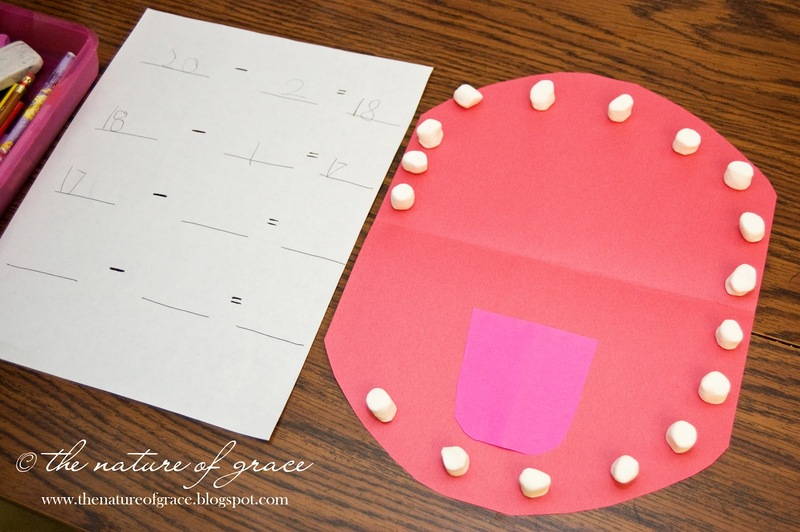 Losing baby teeth is part of growing up, so we made a mouth full of twenty baby teeth and then made up stories about losing teeth and number sentences to show how many teeth were lost and how many teeth were left. :) I believe I saw this idea on a first grade website as well but cannot remember where (if you know or see it, please feel free to send me the link so I can post it here). 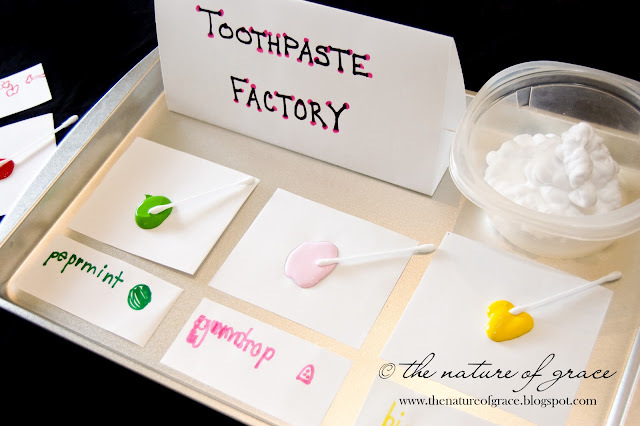 Welcome to our Toothpaste Factory! 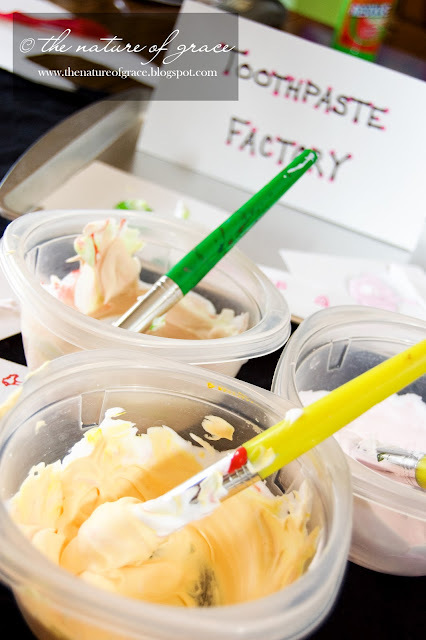 I used leftover shaving cream and paint to create a toothpaste making factory for my daughter. 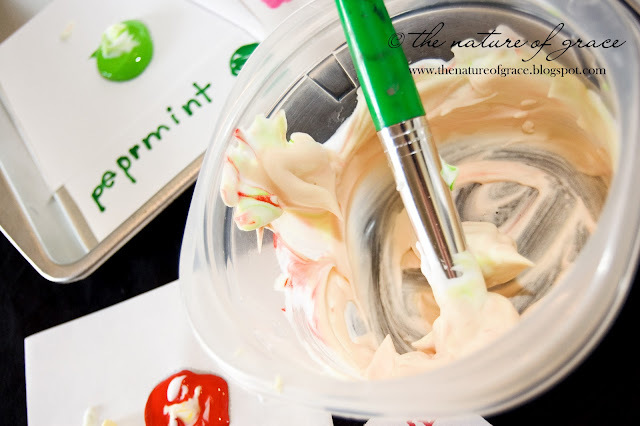 She chose what "flavor" each color of paint would be, labeled them, and then mixed them into the shaving cream to make a new "flavor" of toothpaste. I LOVE these ideas. What a great way to show how to take care of your teeth. I will definitely be doing the lego flossing with my kids! Great theme! I'd love for you to add it on my link party at: http://printabelle.com/?p=3188 Thanks! FUN!!!!!! My husband is in dental school so I think my kids would love this! I'd love if you'd link this up to my link party going on now! My readers would LOVE it too! So fun! Pinning this for Preschool with my kids! This is so cute!! I love the brushing activities. I can see that being a bit hit in my house! What a great little lesson plan, I love the toothpaste factory! Just posted on Craft Gossip!! All fields regarding dental care continue to grow because people consider better care of their the teeth next ever before. Brand new technology has lead to methods that are not since painful as in the past, motivating individuals in the future set for dental treatments. Individuals are additionally dwelling lengthier, thus their the teeth need to go longer. I admire your afford. I really like the pics which provides us great information and helping to enhance out knowledge. Keep it up!!!! Thanks for this great post! We should make our children aware of the things regarding dental health. I thought the way you did this was so creative! 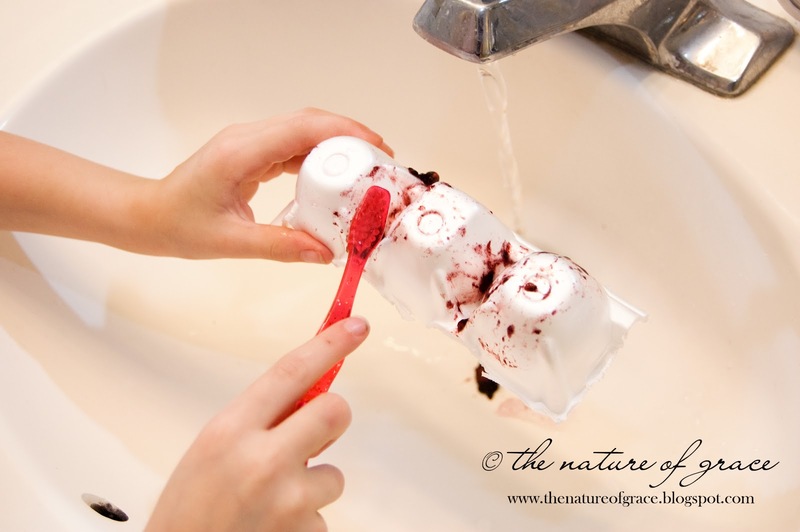 I've got to try something like this with my kids to inspire them to want clean teeth! What other advice do you have regarding toothpaste for kids? Gum recession occurs when the tissue surrounding the teeth wears away,Pinhole surgical treatment is the one method to prevent this as a small tissue is placed over the missing tissue to recover the tissue without using the process of cutting and grafting. Lol, so funny thank you for this interesting article ! Wonderful Article..!! Thank you for sharing the article on Homeschool Theme of the Week: Dentist and Teeth!...Do keep sharing such nice posts with readers...!! I am very much pleased with the material you have described. I preferred to thank you for this outstanding material. I will be looking forward to the new updates.